Smartron, the brand that is invested on by Sachin Tendulkar has the tPhone with a 5.5-inch Full HD display and the phone is one of the lightest with that screen size. With the two-tone colors, the t.phone from Smartron is coming with four options to choose from – Sunrise Orange, Classic Grey, Metallic Pink & Steel Blue. 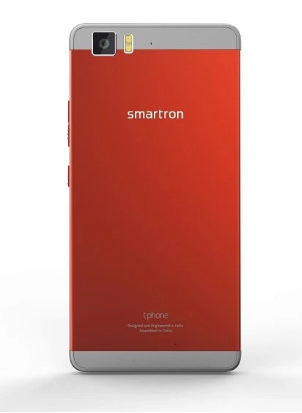 The Smartron t.phone has the Qualcomm Snapdragon 810 processor powering it along with 4GB DDR4 RAM. There are some special features available in the phone, including the Tron.X platform for user experience, 4 microphones for active noise cancellation, Quick charge 2.0 technology with USB Type-C connectivity, and the camera combination of 13-megapixel rear and 4-megapixel front-facing camera. The phone is priced at Rs. 19999 at launch and currently available at Gadgets360 platform. SAR Rating 1.201 W/kg at head and 0.697 W/kg at the body. The Smartron t.Phone has a 5.5-inch 1080p display and it also has the Tron.X platform for some good software and customer support on the Android Marshmallow OS.